Mazda debuted its road legal 205 bhp MX-5 GT Concept at England's Goodwood Festival of Speed last week-end (28th June – 1st July). The Mazda MX-5 GT Concept was displayed throughout the festival on Mazda’s stand, as well as taking part in the hill climb in the ‘First Glance’ category. The Mazda MX-5 GT Concept, inspired by Mazda’s MX-5 GT race programme, is to test customer reaction to a high performance version of the well known sports car. Built by race specialists Jota Sport, the MX-5 GT Concept produces 205 bhp from a normally aspirated 2.0-litre Mazda petrol engine which is matched to the car’s standard manual gearbox. Suspension has been uprated to improve handling and is adjustable for different track conditions, aerodynamic assistance comes from a carbon front splitter, a rear diffuser and boot spoiler. The exhaust note has been enhanced with a sports exhaust system with a central tailpipe. Recaro seats enhance the driver stability and the interior features a number of carbon enhancements to help reduce weight. For customers who want to acquire the car for track use, it comes equipped with road slicks and body-coloured roll hoops behind the seats. Mazda has also entered the World’s fastest and most powerful MX-5 in the Goodwood hill climb. 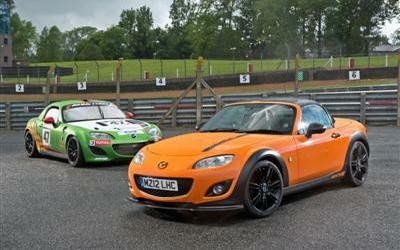 The Jota Sport Mazda MX-5 GT4 is currently contesting the 2012 British GT Championship. Competing against Lotus, Aston Martin, Ginetta and Ferrari race cars, the MX-5 GT boasts a top speed of 160 mph and a 0-60 time of just three seconds, making this a very special MX-5. Drivers for Mazda at the Goodwood Festival of Speed were regular Mazda racers Mark Ticehurst and Owen Mildenhall and kart racer Jade Paveley, who at just 19 years-old, was one of the youngest drivers at the festival.